The 2018 Chevrolet Corvette Carbon 65 will be available in July or early August. The first collectible car of the 2018 model year is a Chevrolet. It's the Corvette Carbon 65, a limited-production model that celebrates the sports car's 65th anniversary. Most U.S. and Canadian Chevrolet dealers will never see the car. General Motors is building 650 Carbon 65s -- 500 for United States sale and 150 for export. That's far fewer than one car per dealer. Chevrolet has 3,000 U.S. dealers and 414 in Canada. The car will be available in July or early August. 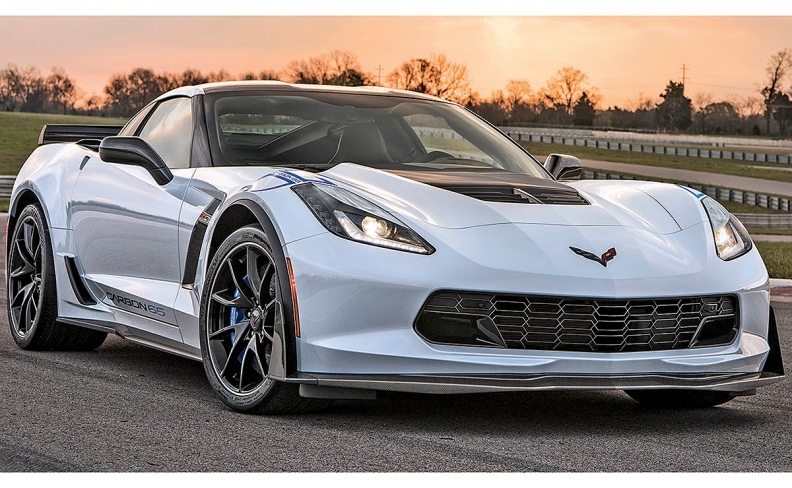 The Carbon 65 is a US$15,000 trim package option available only on Z06 and Grand Sport models, both hardtop and convertible. Exterior features include a carbon fiber spoiler, cooling ducts and ground effects, and a special gray exterior with blue soft top for convertibles. The interior has a carbon fiber steering wheel, special black suede upholstery with blue stitching and special sill plates. Prices start at $81,490 for the 2018 Grand Sport Carbon 65 hardtop and climb to US$99,490 for the Z06 convertible. Shipping prices have not been announced. The Corvette began production on June 30, 1953, and except for 1983, has been in Chevrolet's lineup every year since. Canadian pricing hasn't yet been announced.